Linda Cavanaugh is a member of the Oklahoma Broadcasting Hall of Fame and the Oklahoma Journalism Hall of Fame, where she was inducted as “one of the most distinguished journalists in the history of the state.” Cavanaugh’s career has been marked by a number of historic firsts, which includes becoming the first female co-anchor of the evening newscasts at KFOR-TV. Her compelling documentary about the Oklahoma City bombing, “Tapestry,” followed victims and family members for a year as they battled the aftermath of an event that changed the face of our state and our nation. (“Tapestry” received the 1997 Headliner’s Award, the honor given to the best broadcast program in the nation – network programming included.) Her outstanding service has benefited the lives of women and families for four decades. (In 1993, she received the State of Oklahoma’s Humanitarian Award.) In 2016, her series, “Faces of The Bombing,” was honored with a national Edward R. Murrow Award in New York City. In 2015, Cavanaugh and the KFOR-TV team received a national Emmy Award for their live coverage of the Moore 2013 tornado. Glenda Love has been the executive director of the Ronald McDonald House in Tulsa for 17 years. Ms. Love served as a board member for Resonance, an organization that helps disadvantaged and battered women get back on their feet, the Simon Estes Foundation that provides college scholarship to under-privileged youth and the Tulsa Women’s Foundation that provides grants to women seeking to advance their careers. Ms. Love’s personal honors include the Pinnacle award for Community Service from the Mayor’s Commission on the Status of Women and the Maxine Cissel Horner Spirit of Community Excellence Award, The Community Excellence Award from the community-based organization, Jazz Hall, for her significant contributions. Love also serves on the board of trustees of OSU-Tulsa and the McDonald Corporation Global Advisory Council. She is a strong advocate for community projects as well as for cultural enrichment for the Tulsa community. Meg Salyer From her first volunteer assignment with the Woman’s Committee of the Symphony in 1984 to her service today on 20 corporate and non-profit boards, Meg’s focus has been on improving the quality of life, and expanding opportunities, for women, children and families. Meg has served as the only woman on Oklahoma City’s City Council for Ward 6 for more than eight years. For these efforts, she was recognized in 2016 with the United Way’s John and Berta Fay Rex Community Builder Award and received the Junior League’s Mary Baker Rumsey Lifetime Achievement Award in 2012. In 2003, Salyer was elected the first woman president of the Rotary Club of Oklahoma City. From her first volunteer assignment with the Woman’s Committee of the Symphony in 1984 to her service today on 20 corporate and non-profit boards, Salyer’s focus has been on improving the quality of life and expanding opportunities for women, children and families in her adopted home. Rhonda Walters is the president of Oklahoma Property Investors and serves as a broker of record for five sales associates. 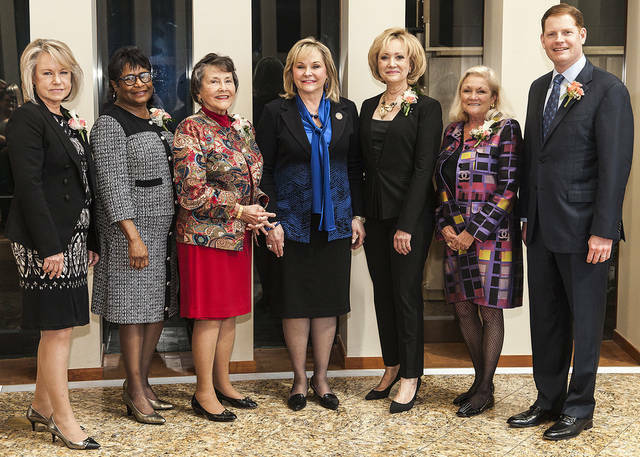 She has had a life-long commitment to improving the quality of life for women, children and families in Oklahoma. Her primary focus has been in the areas of education and children’s issues. From organizing the highly successful Healthy Futures Immunization Campaign when she was Oklahoma’s First Lady, to establishing in her son’s memory with the Shaun Walters Chair in Developmental/Behavioral Pediatrics through Children’s Medical Research Foundation, Walters has been active in Oklahoma children’s advocacy, business and political affairs for more than 30 years. Rhonda has received several awards and she has served on the Board of Directors or chaired numerous nonprofit organizations in Oklahoma. Rhonda has had a life-long commitment to improving the quality of life for women, children and families in Oklahoma. She was instrumental in working with her husband to support the creation of the permanent Oklahoma Commission on the Status of Women.